• Peel the pineapple and cut into 4cm chunks. Set aside. Also cut the pork in 4cm chunks and place in a bowl. • Mix the rest of the ingredients together and massage into the pork cubes. Rest at room temperature for 30 minutes. 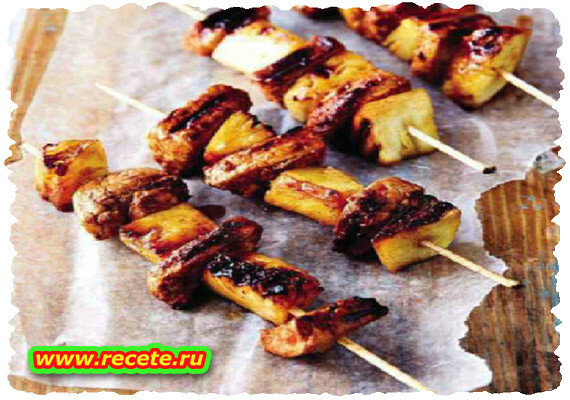 • Thread the pork and pineapple pieces onto skewers. Brush with oil and braai for 2-3 minutes a side over hot coals until charred and the pork is cooked to you liking. • Cover loosely with foil and rest for a few minutes. Serve with chilli sauce, another squeeze of lemon juice and sweet potato wedges.